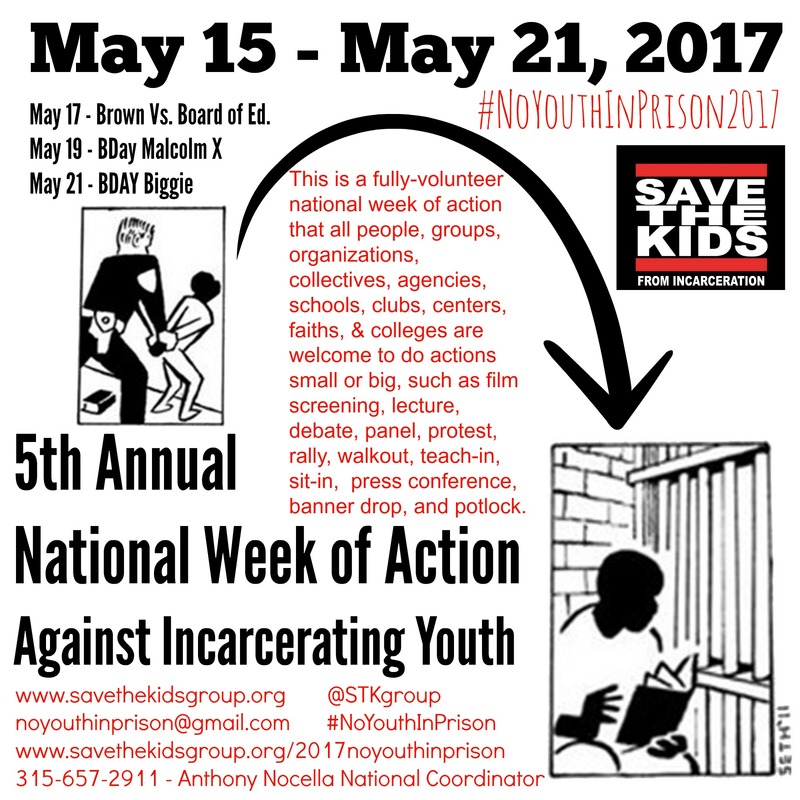 During the 2017 5th Annual National Week of Action Against Incarcerating Youth organizations, groups, collectives, mosques, synagogue, community centers, bookstores, schools, clubs, churches, recreation centers, and temples, are organizing in their communities around the country daily events during the week aimed at raising awareness about the school to prison pipeline and ending the incarceration of all youth. HISTORY: The National Week of Action Against Incarcerating Youth (NWAAIY) was founded in 2013 to dismantle the prison half of the school-to-prison-pipeline. The National Week of Action Against Incarcerating Youth is a fully-volunteer project organized by hundreds of groups and individuals around the United States. GOALS: Another world is possible, and it begins with community based programs and alternatives such as rehabilitation, therapy, counseling, job readiness workshops, tutoring, more community programs and centers, and transformative and restorative justice programs in the community and in schools to address conflicts. Incarceration is not the solution, but the problem. Once youth are involved in the juvenile justice system, it is hard for them to get out of it. Please support youth and their futures and demand that no more youth are incarcerated no matter the crime/harm they have committed. Incarceration does nothing to address the needs of the community, those harmed, and the youth who have committed the harm. YOUTH: The juvenile justice system targets four youth groups for incarceration; they are the following, in no specific order: (1) Youth of Color, (2) Youth with Disabilities, (3) Economically Disadvantaged Youth, and (4) LGBTTQQIA Youth.